Death Note Tumblr. Confession (not mine). I honestly cannot tell anda how well this sums up my feelings about the series. 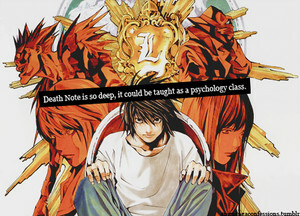 :D. Wallpaper and background images in the death note club tagged: photo death note tumblr confession. ^Lol, I think it would be a useful lesson, but, unfortunately, I think that it would be taken as too debatable (even though the truth in this series is pretty obvious, in my opinion :p).